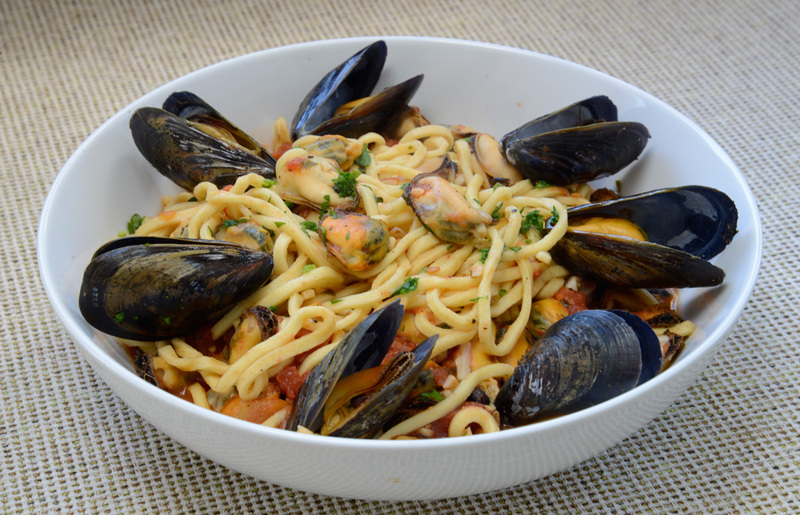 The sweetness of mussels partners beautifully with the fresh scent of parsley in a simple tomato and white wine sauce. I love this seafood sauce with long pasta, preferably spaghettini, spaghetti, or, my absolute favorite, the square, long noodles known as spaghetti alla chitarra typical of Abruzzo and Molise. 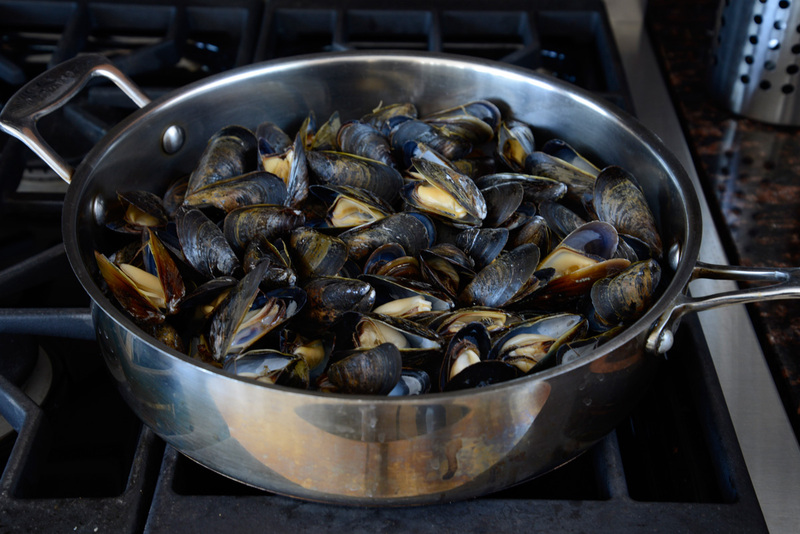 Be careful of any mussels (or clams, cockles, and other bivalves) that are open before cooking. If they appear open, tap them on the inside of a bowl to see if they close; if they close, they are alive and can safely be cooked, but if they do not close, discard them. Also be sure to discard any mussels that are still closed after cooking. Make the sauce: Rinse the mussels several times to get rid of any surface grit, pull off any beards, then place in a deep bowl and cover with cool water. Add 2 tablespoons of the salt and swirl with your hands to dissolve the salt in the water. Set aside to purge any sediment and grit for 30 minutes at room temperature. 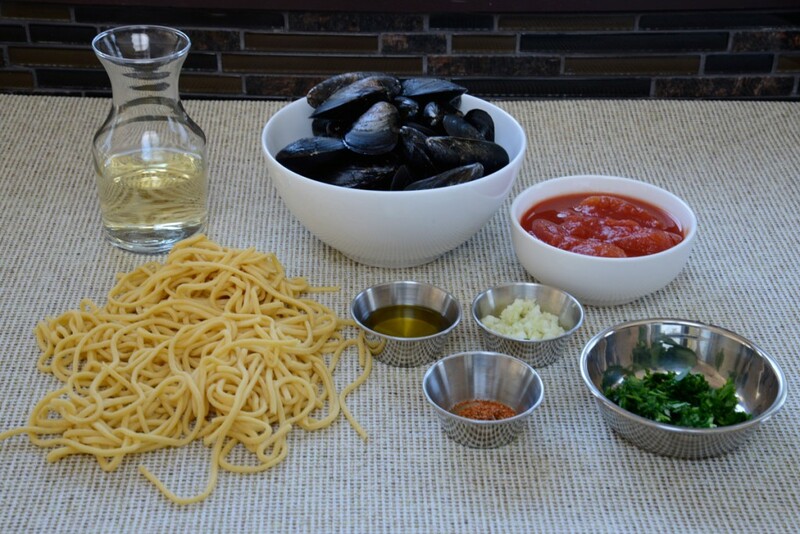 Remove the mussels from their soaking water by scooping them out with your hands, thereby avoiding disturbing the sediment at the bottom of the bowl. Rinse the mussels several times in cool water. 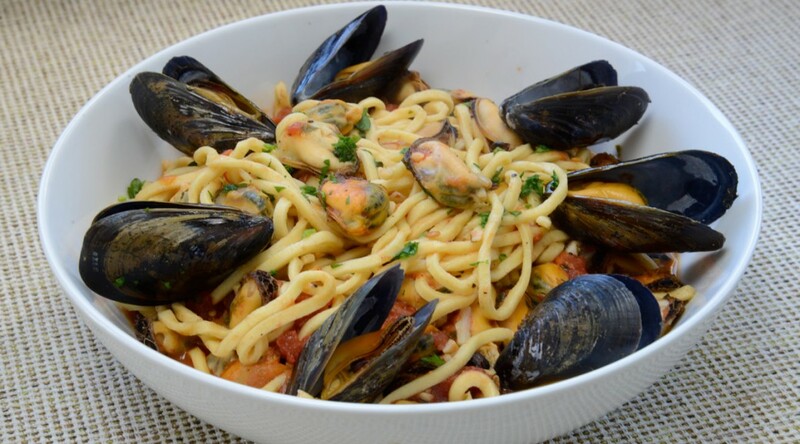 Place the mussels in a saucepan large enough to accommodate the pasta later. Add the wine and cover with a tight-fitting lid. Cook over medium-high heat, shaking the pan once in a while, until the mussels yawn open, about 8 minutes. Uncover and cool 10 minutes, or until cool enough to handle. Shell the mussels, reserving a few in the shell, and discard any mussels that have not opened. 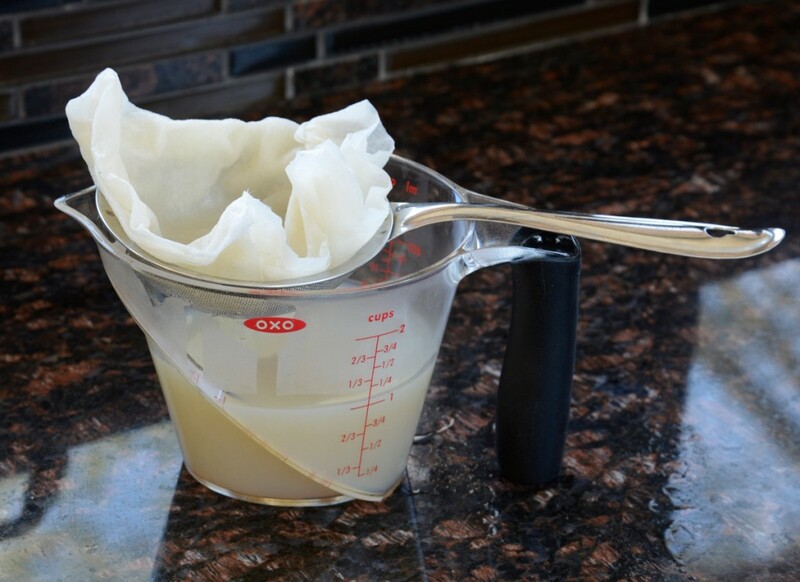 Strain the mussel cooking liquid through a sieve lined with a paper towel (or through a coffee filter) to get rid of any sediment. Set the strained liquid and the mussels aside. Rinse out and dry the saucepan. Place the olive oil with the garlic, parsley, and chili in the clean saucepan and warm gently over medium heat until fragrant, about 1 minute. Add the tomatoes and season with the remaining ½ teaspoon of salt and the pepper. Cook, covered, for 5 minutes, or until the tomatoes take on an orange hue. Stir in the mussels and the strained mussel cooking liquid, and bring to a gentle boil; cook 5 minutes. Adjust the seasoning and keep warm. When you are ready to serve, cook the pasta: Bring 5 quarts of water to a boil. Add the salt and the pasta. Cook until al dente, then drain, reserving 2 cups of the pasta cooking water. Toss the drained pasta and the parsley into the sauce. Sauté 1 minute over high heat to meld the flavors, thinning out the sauce as needed with some of the reserved pasta cooking water. Serve hot, drizzled with the olive oil.